birds-on-a-wire is an acoustic folk group with a unique style comprised of original song-writing and rich harmonies. Lyrical and narrative, many of their tunes will take you to another place or time. Mostly uplifting, their foot-tapping sound can also unexpectedly reach serious, candid reflection. Brooke Pevear’s vocals, guitar and banjo, interwoven with Elaine Verstraete’s vocals and stand up bass produce a depth of sound that is straightforward and honest. They have been likened to The Wailing Jenny’s and have also been referred to as a modern version of Simon and Garfunkel. Tossing in the occasional cover tune, you may get a sprinkling of Hank Williams, Gillian Welch or even a bluegrass traditional. A prolific songwriter, Brooke began collaborating with Elaine in late 2003. Having produced two solo CDs, Brooke released her third album, “Bittersweet” in 2006, which features Brooke compositions and Elaine harmonies and accompaniment. birds-on-a-wire just recently announced the release of their new CD titled "It is what it is". 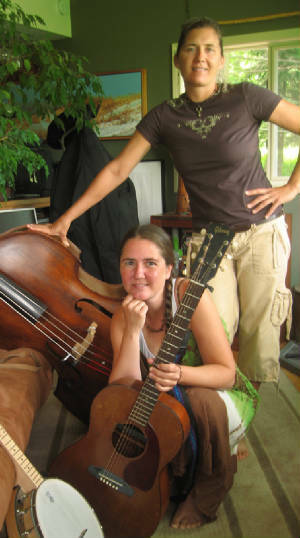 A reflection of eight years of collaboration, the CD highlights both Brooke and Elaine’s songwriting, and also includes guest players Perry Cleveland and Perrin Yang who join them frequently on “the wire”. Great music to experience live, be sure to check their schedule of upcoming events.